DARAGA, ALBAY (Sept. 29) – A 30-minute exchange of fire ensued about 8:00 PM Thursday, September 28, when armed groups believed to be NPA pounded with bullets the PNP Public Safety Battalion Company Detachment in Barangay Bascaran, here. This was confirmed by a PNP personnel assigned in the area who requested anonymity. He said that the PNP troops managed to manuever and successfully maintained an advantage position and returned fire to the attackers and drive them away. No casualty on the part of the gov’t. troops were reported while investigation and hot pursuit operations is on going. 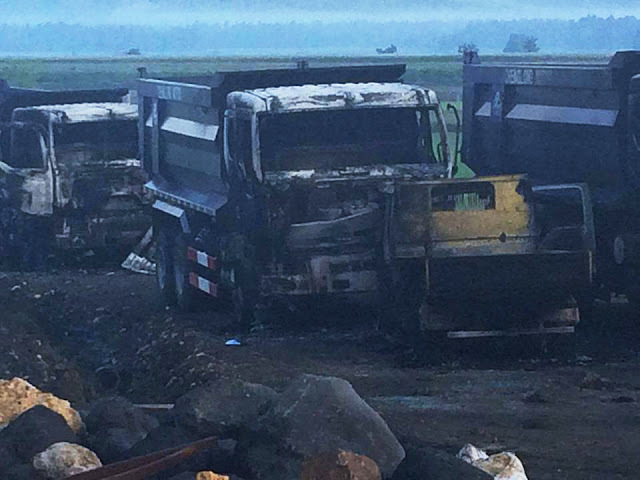 Meanwhile, 11 heavy equipments of El Cuerpo Construction Corp. at the Bicol International Airport Site at Barangay Alobo were burned by still unidentified perpetrators simultaneous with the harassment of the PPSBC Detachment. The burned heavy equipments consists of one (1) transit mixer, five (5) dumptrucks, one (1) grader and two (2) other vehicles. As of this writing the management of the construction firm has not issued statement yet regarding the incident.